You sit down at your computer and plug your flash drive in, just like you always do. But this time something’s different. Your computer doesn’t recognize the drive and the little light doesn’t turn on like it usually does. Unfortunately, this is a common occurrence. Flash drives can and do fail. Yesterday my wife asked if I could help a friend get the files off of her dead flash drive. This isn’t the first time I’ve been asked to do data recovery and frankly, the results have been mixed. Sometimes the drive is stone dead and with the exception of paying for an expensive data recovery service, the files are gone. Other times the results are better. When my mother-in-law’s hard drive died a few weeks after the warranty had expired, I was able to get everything off the drive. Another friend wasn’t so lucky. After spending a long night trying various tools and strategies, I wasn’t able to recover much of anything for him. Before I show you how to recover files from a dead flash drive, I want to save you the trouble to begin with. Flash drives are great. They’re small and convenient, but as I mentioned earlier, they’re not reliable. They can fail, and when I’m called in it’s usually because the failure happened at a bad time. My brother’s fiancé had her flash drive die just after she had finished entering all of the semester’s grades. I helped a lady in our neighborhood who was just about finished with the final draft of her college term paper when her flash drive failed. Having backups gives you piece of mind. Having a flash drive die becomes a minor nuisance. But you can buy a new one and move on. 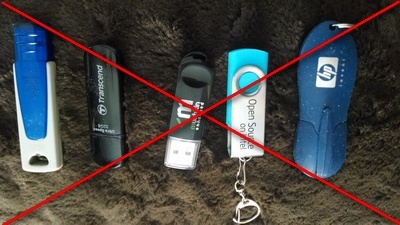 Backups are by far the best solution to failed flash drives, but the pesky thing about backups is you have to do them before there’s a problem. If you haven’t heard of Dropbox, you’re in for a treat. It’s been called a flash drive in the cloud and for good reason. When you sign up for the free service, you install a program that sits in your tray and continually checks your files for any changes in the Dropbox folder. If you’re writing a paper and hit save, Dropbox sees the change and sends the updated file to their servers seconds after. With your important files in Dropbox, your computer could blow up and you could get on a new computer, installed Dropbox, and keep on working where you left off. But that’s only half of the benefit. You can also share files between your or your friend’s computers. But we won’t get into that for now. Suffice it to say, I highly recommend using Dropbox for files you don’t want to lose, and only use your flash drive to carry files around that are already safely in Dropbox. I know. If you’re reading this, you may be annoyed at the above paragraphs. I hoped to catch you before your flash drive died, but if not, let’s go through your options. There are several reasons why your flash drive may not be working. We’ll go from the simplest solutions to the most complex. Not all USB ports are made the same. On my wife’s computer the ports in front didn’t get as much power as the ones in back. It seemed like her flash drive was dying when in fact it just wasn’t getting enough juice. It was a hassle to crawl around to the back and plug it in, but when I did, the drive worked fine. It’s become a running gag in the IT support world that all you have to do is tell the person to reboot and all their problems are solved. The truth is it can help sometimes and it’s worth a try. The good news is your flash drive may be just fine. The bad news is your computer might be the one that’s ailing. In any case, it’s worth trying your flash drive in another computer to rule out the possibility. PhotoRec is a good first option. It’s free and it’s not just for photos (as the name might imply). It will ignore the file system and try to read the data directly, as long as the drive is recognized. Unstoppable Copier is another free option. It works similarly to PhotoRec, but it’s always good to have options. R-Studio costs $79. The good news is you can download a free demo to see if it can recover any files. Now we’re getting desperate, but fear not, sometimes all it takes is a little jiggling inside and your drive will work again. Your thumb drive may not be working because the connections inside can get loose or disconnected. Be aware that you run the risk of damaging the drive if you take it apart. If you’ve tried everything else, it’s worth having a go. Here’s an illustrated guide on how to take your drive apart and see inside. If you happen to have a soldering iron lying around, you could use it to fix the connections permanently. Otherwise you’re probably looking at a temporary fix to get the files. As a last resort, you can send your drive away for recovery, because it can be expensive. If the lost files are valuable, this may work for you. Mat Honan paid $1,690 to recover the files from his Macbook Air. DriveSavers is a well known and reputable recovery service. The best way to deal with this problem is to prevent it entirely with backups. If you’re reading this and your flash drive is still working, back it up now! Otherwise, I wish you the best of luck on your recovery process. If you have questions you can set up a time to chat in the sidebar. John, a friend of mine, offered to help out with the flash drive my wife had mentioned yesterday, and he tried PhotoRec among others and didn’t come up with much of anything. The R-Studio demo however found quite a few files. In this case at least, you get what you pay for.